I decided to ring in the new year in a city I’ve always been curious about but never visited, Miami. It felt like the right time to be in a tropical place. Even though Austin doesn’t get too cold, it’s still not warm enough to lounge by a pool on any given winter day. Now, here’s a secret of mine. Whenever I go on a vacation, I put together a lookbook that helps me pack and gets me excited about the city. It also allows me to try out different styles that I wouldn’t normally wear in Austin. A lookbook is also really practical for packing if you’re like me and try to get by on only one carry on bag. You’ll choose items that can work double duty and hopefully limit excess clothes. 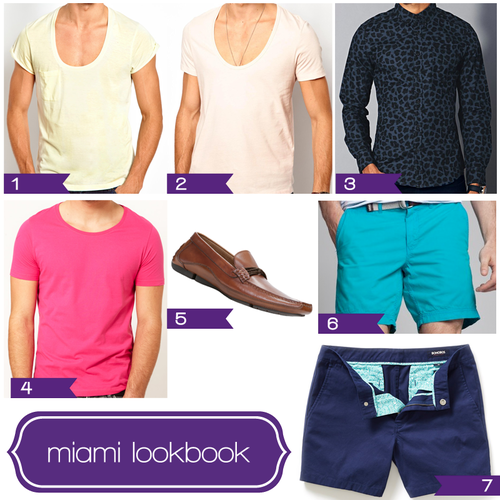 For Miami, I decided to go with bright, bold colors, plunging necklines, patterns, and jewelry. I’m not afraid of bold colors, so that wasn’t something new but I very rarely dabble in patterns or jewelry and was really looking forward to it. I have a few rings and necklaces lying around but patterned textiles are little more difficult to find in my own close. Unfortunately, only my New Year’s Eve look involved some patterns but I really hope to take some of my Miami style inspiration into the new year.